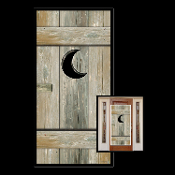 Hilarious bathroom door cover, featuring a Classic Quarter Moon on Old Barn Wood Design. Humorous Old-fashioned Door Cover Restroom Design is plastic, so can be wiped clean. Features a back woods camping theme Latrine. Great addition to any back yard BBQ, birthday party or Privy for a retro nostalgia picnic scene, etc.